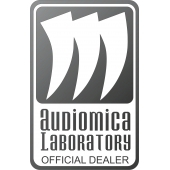 The basic series of Audiomica Labortory audio-video cables. The cables are made of OFC multi-wire copper conductors and FEP dielectric. Black series cables are screened with OFC copper braid and metalized foil. In addition, signal is filtered by DFSS and PFSS filters. The cables are hand-manufactured and tested for electrical correctness in our laboratory.